Drugmaker confirms FDA probe, likely involving suit over record keeping at plant. NEW YORK (CNN/Money) - Federal regulators are investigating a former employee's allegations of false record-keeping at a Johnson & Johnson plant that makes an anemia drug linked to serious side effects, the drugmaker said Friday. Shares of Johnson & Johnson (JNJ: down $7.88 to $41.85, Research, Estimates) closed 16 percent lower in trading Friday following the report, making it the biggest loser within the Dow Jones industrial average. 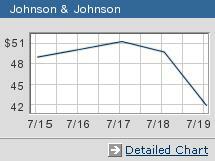 The drop in J&J stock helped push the Dow below its post-Sept. 11 low. The New Brunswick, N.J.-based company is also under a criminal investigation by the Department of Justice, the New York Times reported Friday, although Johnson & Johnson did not confirm any DOJ probe into activities at the Puerto Rico plant. J&J's losses were the latest problems for the drug sector, which has been under siege amid pressure to lower prices even as the industry faces competition from generic drug makers taking advantage of patent expirations. In a statement Friday, Johnson & Johnson acknowledged that the Food and Drug Administration is investigating allegations made in a civil suit filed by a former employee who worked at the company's Ortho Biologics manufacturing facility in Manati, Puerto Rico. In the suit, the employee claims that Johnson & Johnson failed to properly complete equipment records and that his supervisors repeatedly directed him to falsify records between 1996 and 1998, according to the company's statement. The suit implies those actions led to side effects in the company's anemia drug, Eprex, which is made at the plant. "After a thorough investigation of all the allegations, the company found no corroboration of the allegations," the company said in its statement, adding that it intends to fully cooperate with the FDA. "We are unaware of the precise nature of the FDA's interest, but are taking the matter with the utmost seriousness," the company said. "We remain confident that the allegations in the lawsuit would not have affected product integrity at the manufacturing plant. The company intends to vigorously defend against the lawsuit brought by the former employee." The FDA would say nothing about the probe. "Our position is we don't confirm or deny any investigations," FDA spokeswoman Monica Revelle said. Daniel T. Lemaitre, who covers J&J for Merrill Lynch, said the Puerto Rico plant cited in the allegations has been under major scrutiny due to side effects from the anemia drug Eprex made there. In the side effect, pure red cell aplasia, anemia patients lose the ability to produce red blood cells, leaving them dependent on blood transfusions to survive. It reportedly has affected 141 people in Europe and Canada. "Based on the investigation, there is no connection between the allegations of the former employee and the occurrence of PRCA. The active investigations of PRCA have included thorough investigation by Johnson & Johnson as well as the FDA and French health authorities representing the European Union," the company said. Johnson & Johnson said the Ortho Biologics plant underwent a two-week FDA inspection in October, 2001, stemming from cases of immunogenicity associated with Eprex. The inspection resulted in "minor observations," the company said. In June, the French health authority conducted a four-day investigation that also turned up just "minor observations," all of which have been addressed, the company said. Lemaitre expressed confidence in the company, yet downgraded the stock Friday. "While we suspect little, if anything, will stem from this investigation, JNJ may be vulnerable since it still commands a 20 percent premium to the S&P 500 and its medical technology and medical device peers," Lemaitre told clients. He downgraded JNJ to "buy" from "strong buy." Eprex is expected to see $1.3 billion in 2002 sales , or 4 percent of company sales, Lemaitre said. The employee who filed the lawsuit, Hector Arce, alleges he was pressured to fill out records improperly, including an incident when he wrote in a log book that an alarm on the boiler he operated went off, indicating carbon dioxide and the acidity of the fermentation process were outside specifications, the Times reported Friday. Arce claims a supervisor reprimanded him for logging the activation of the alarm and removed the page from the records, the paper reported. J&J was the second-most actively traded issue on the New York Stock Exchange Friday; more than 50 million shares changed hands. Drug stocks, among the best performers of the late 1990s, have been tumbling this year. Questions of how the companies will handle upcoming patent expirations have dogged the industry, which is also under pressure to stem the rising costs of medications. Accounting questions haven't helped. The Securities and Exchange Commission has been informally investigating Bristol-Myers Squibb's sales practices. And Merck earlier this month said it recorded $14 billion in revenue that it never actually collected.